When I was a little girl, I never had a genuine Barbie doll of my own. That is why I've always had a fascination for them, especially the couture dolls. They just seem so beautiful and exquisite. Eventually, I began to start a collection of Barbies. I had a small collection by the time our first son was born, but I stopped adding to it because I could not see spending the money when we had another mouth to feed. 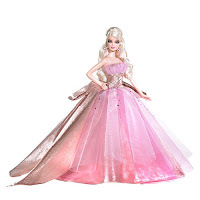 Then the twins came along, one of which was a girl, so now I am patiently waiting for our daughter Makenzie to be old enough to play with Barbie dolls. My daughter is now nearly 3 yrs old. I will have to wait until she can care for a doll properly before I start her on Barbies. This may not happen for another year or two, but I can still imagine her little face lighting up when she sees a beautiful doll like this 2009 Holiday Barbie under the tree on Christmas morning. I suppose I just need to continue to be patient.